The true story of Kate Warne and the other women who served as Pinkertons, fulfilling the adage, "Well-behaved Women Seldom Make History." Most students of the Old West and American law enforcement history know the story of the notorious and ruthless Pinkerton Detective Agency and the legends behind their role in establishing the Secret Service and tangling with Old West Outlaws. But the true story of Kate Warne, an operative of the Pinkerton Agency and the first woman detective in America--and the stories of the other women who served their country as part of the storied crew of crime fighters--are not well known. For the first time, the stories of these intrepid women are collected here and richly illustrated throughout with numerous historical photographs. From Kate Warne's probable affair with Allan Pinkerton, and her part in saving the life of Abraham Lincoln in 1861 to the lives and careers of the other women who broke out of the Cult of True Womanhood in pursuit of justice, these true stories add another dimension to our understanding of American history. 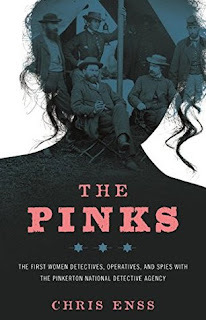 After listening to Greer Macallister's Girl in Disguise, a fictionalized account of Kate Warne's life as a Pinkerton operative, I eagerly dove into The Pinks by Chris Enss. History fascinates me, especially when it is about women who stand out from the norm during their time. Kate Warne is one such woman. Just the name Pinkerton itself tends to pique my interest. The Pinks: The First Women Detectives, Operatives, and Spies with the Pinkerton National Detective Agency offers a look into some of the cases Kate Warne and her associates were involved in early in the agency's life. Allan Pinkerton raised a few eyebrows when he decided to hire Kate Warne in 1856, his first female operative. She became the first female detective in the U.S. as a matter of fact. Not much is known about Kate Warne, unfortunately, even today, as Chris Enss points out in her book. Many of the records about her exploits are believed to have been destroyed in a fire. What is known, however, is enough to show that she was very capable and gifted in her craft. She seemed to have a way about her that encouraged people to open up to her--and she used to it well to take down criminals, learn of plots against the president or country, and solve whatever mystery was presented to her. While Kate Warne is the main focus on The Pinks given the amount of page space devoted to her exploits, other talented operatives are mentioned, and their stories shared. I was happy to see mention of Hattie Lewis Lawton, who also appears in Macallister's novel. Another name that caught my immediate interest was Union spy Elizabeth van Lew. The Pinks is well researched, and, while a bit dry, was an engrossing read. I wouldn't have minded more cohesiveness between each chapter, each chapter reading more like like individual stories or vignettes. Nor were they in any sort of chronological order. That could be just a personal preference on my part, however. Overall, I liked The Pinks and found it to be informative. At a time when women were expected to play a more traditional part in society, the women featured in the book were among the pioneers for the roles that would open up to women in law enforcement type agencies in the years to come. To learn more about Chris Enss and her work, please visit the author's website. Sounds really fascinating. I love to read about women taking roles that were unconventional! Jill - It was really interesting to read about some of these women's experiences. I am so loving that Kate Warne was the first female Pinkerton for real. She sounds brilliant and I HATE that her cases were lost in a fire. Boo. Verushka - I hate that her records were destroyed too. I would love to know more about her life and experiences. I've read several novels connected to the Pinkerton Agency so I'm adding this nonfiction to my list! Also Ben MacIntyre's The Napoleon of Crime, which is a nonfiction account of Adam Worth (the inspiration for A.C. Doyle's Moriarty) and the pursuit by the Pinkerton Agency. Jenclair - I definitely am interested in reading more about the agency. I will give The Napoleon of Crime a try. It sounds like a good one too. Thank you for the recommendation! Not something I knew about but these women sound fascinating. Tracy - I didn't know much about them either, but so fascinating! I think it is great that you read a non-fiction account of Pinkerton after reading the fictional story. This does sound really interesting. Eustacia - I enjoyed it. I hope you are able to find them! I just put this book on my library list so I'm glad to see the review. It is too bad there isn't more cohesion between the chapters and it always puzzles me when a non-memoir isn't in chronological order. Regardless of that this sounds like a fascinating subject and I'm looking forward to reading this book. Katherine - The subject matter is what kept me most interested in this one.